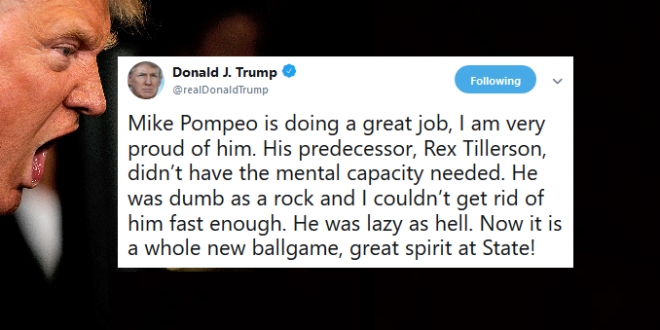 Trump: Rex Tillerson Was "Lazy And Dumb As A Rock" - Joe.My.God. Glorious Leader is ever so pissed at his former secretary of state Rex Tillerson, who earlier today declared (on video) that his former boss is undisciplined, won’t read anything, much less his press briefings, and had to be talked about committing “illegal acts” multiple times. The infighting will never end. But now the press gets to resurface all of the fawning praise for Tillerson spouted by Trump in the past. WATCH: Former Secretary of State Rex Tillerson is speaking publicly about what led to his firing in March by President Trump.